It is widely believed that antibody is important in prevention of reinfection and possibly in recovery from infection as well. However, it is far from easy to determine how such antibody acts. However, immunoglobulin-mediated immunity is easily demonstrated by adoptive transfer to naive animals. In this way it was shown that some monoclonal IgGs which neutralize in vitro confer protection in vivo and others do not; the latter include antibodies to mouse hepatitis virus Talbot et al. 1984; Buchmeier et al. 1984, HSV-1 (Rector et al. 1982, Kümel et al. 1985), HSV-2 (Balachandran et al. 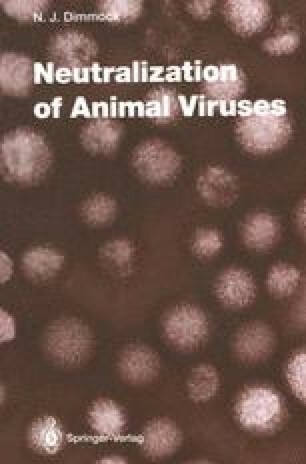 1982) and bovine coronavirus (Deregt et al. 1989). Table 7 appears to show a fairly close correlation between these two parameters but this may be the result of a bias against reporting negative data in the literature; certainly it could never be assumed that a neutralizing antibody would protect in vivo. What properties make for protection are not known. There may be a huge range in efficacy: Mathews and Roehrig (1984) found that one neutralizing mab to Saint Louis encephalitis virus (SLEV) was 1000-fold more protective than other neutralizing mabs to the same protein. They concluded in an earlier study that avidity and topography of binding were important factors in protection by neutralizing mabs to Venezuelan encephalomyelitis virus (VEEV) (Mathews and Roehrig 1982). Administration of particular neutralizing mabs may prevent death but result in chronic disease (MHV-4, Buchmeier et al. 1984; Aleutian disease parvovirus, Alexandersen et al. 1989). The elimination of the immunoglobulin response in chickens by bursectomy led to the suggestion that endogenously produced antibody potentiates disease during infection by the infectious laryngotracheitis herpesvirus, possibly by increasing the viscosity of the tracheal exudate, leading to death by axphyxiation (Fahey and York 1990). Bursectomy also exacerbated avian influenza (Portnoy et al. 1973). The beneficial effects of adoptive transfer of immune serum to influenza virus-infected mice was first demonstrated by Loosli et al. (1953) and anti-HA is the most effective anti-viral antibody (Virelizier 1975; Virelizier et al. 1976; McLain and Dimmock 1989). Inoculation of athymic mice with a type A influenza virus causes a persistent infection. Adoptive transfer of mab to the HA reduced shedding of virus and allowed resquamation of the trachel epithelium to occur, but the virus was not cleared and, as the antibody titre waned, re-desquamation took place (Kris et al. 1988).